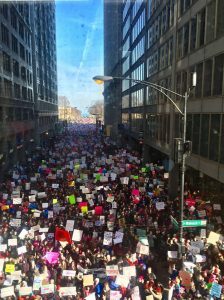 In Chicago, an estimated 300,000, mostly women, filled the streets. Photo: Frieda Gustafson Meier. 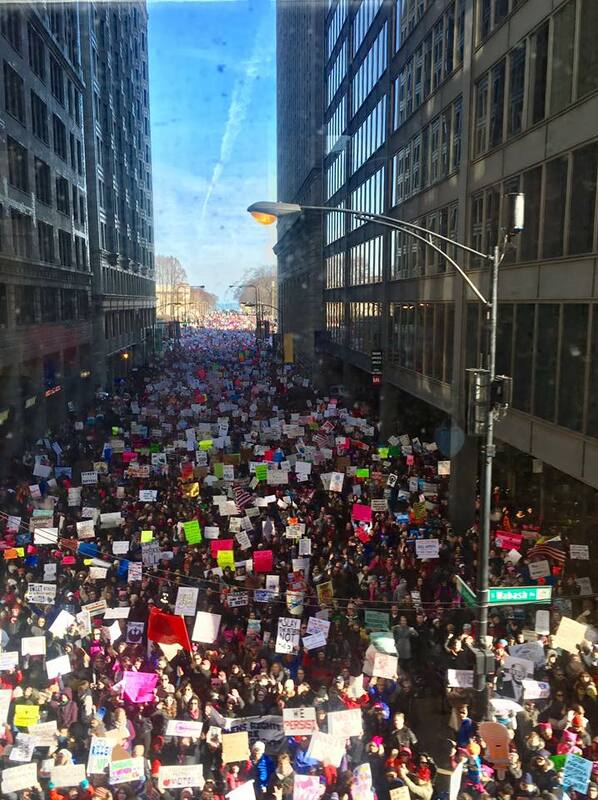 Chicago—As we go to press, Women’s Marches took place around the U.S. and the world, once again showing that the opposition to Trumpism is alive, thriving, militant and exuberant. Washington, D.C., Chicago, Los Angeles and New York led in numbers, but women also marched in the San Francisco Bay Area, Denver, Cleveland, Las Vegas, Park City, Utah, St. Louis, Dallas, Asheville and Raleigh, N.C., and in over 250 other cities where we made our voices heard in great numbers. 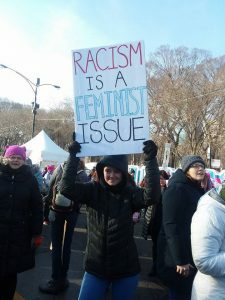 Worldwide, women marched in Rome, Beijing, Buenos Aires, Toronto, Zurich, London and elsewhere. While U.S. March leaders wanted the emphasis to be on electoral politics, registering voters and voting Trump and his ilk out of office, signs carried by participants as well as discussions with many who marched revealed that the humanism that marked the 2017 Women’s Marches remains. Women marched for Black lives, for immigrants’ rights, for the disabled, for LGBTQ people—in short for a radically different world than the one Trump is trying to force on a resisting population. One of well over 50,000 Marchers in Oakland, Calif. on the 2018 Woman’s March. Photo: Urszula Wislanka. Trump has been trying to destroy movements for freedom. The weekend of Jan. 20-21 shows how completely he has failed. This entry was posted in Articles and tagged Asheville North Carolina, Bay Area, Beijing, Black lives, Buenos Aires, Chicago, Cleveland, Dallas, Denver, disability rights, feminism, Humanism, immigrants' rights, Las Vegas, LGBTQ rights, London, Los Angeles, movements for freedom, New York, Park City Utah, Raleigh North Carolina, Rome, San Francisco, St. Louis, Terry Moon, Toronto, Trumpism, Washington D.C., Women's March, Women's Marches, Zurich. Bookmark the permalink.